When you take one of our brush lettering workshops, we hope you will find a new creative outlet, a helpful skill in your business or career, or give yourself the gift of self-care and inspiration. This is a workshop for beginners who have never touched a brush pen or calligraphy pen, or those who have just started to dabble lettering. For those of you who think you are “not creative” or have “bad handwriting,” trust me this workshop is for you. You can and will learn! Believe it or not, my every day handwriting is nothing special. Hand lettering is much different than hand writing or even cursive. It is a practiced skill, and with time, practice and patience, I truly believe anyone can learn. This Brush Lettering 101 Workshop will cover beginner brush lettering techniques and the lowercase alphabet, with both brush pens and a water brush with watercolors. I am self taught, so you can expect no pressure, prestige or fancy terms. We’ll gather around a table with my favorite tools, and tried-and-true practices and techniques that have worked for me over the years. Since 2015, thanks to the support of our community, our workshops have continued to sell out, and we have now taught over 1,000 students! Teaching is one of my greatest joys in my business, and I’m fortunate that as I’ve continued offering workshops, you continue to show up and sell us out. When is the next workshop? How many workshops are offered a year? I typically announce 1-2 workshops at a time, most often 2-6 weeks in advance. I don’t typically release a whole schedule of dates at one time. Depending on the year, I offer around 9-12 workshops per year. How can I be notified about the next workshop? Sign up for emails at the bottom of my website. My email list will be notified about new workshops first! Also follow along on Instagram @laurenheimstudio. Workshops are typically hosted at different venues around Kansas City, mainly in Overland Park, Prairie Village and Leawood. Right now I do not host workshops outside of Kansas City, but if you have an interest, please send me an email and let me know! I’d love to hear from you. Some of my past workshops have been held at Dolce Bakery in Prairie Village, Olive Tree in Overland Park, Pink Antlers Studio in Leawood, West Elm on the Plaza, Pilgrim Coffee in Overland Park, Caffetteria in Prairie Village. In past years, we had workshops in Manhattan, KS as well. What is the difference between calligraphy, brush lettering and hand lettering? Well, every artist you speak with may have a slightly different interpretation of the different terms such as calligraphy, brush lettering, hand lettering, fauxligraphy and so on. Calligraphy is traditionally known for using pressure to write with nib and ink (with either an oblique or straight pen). 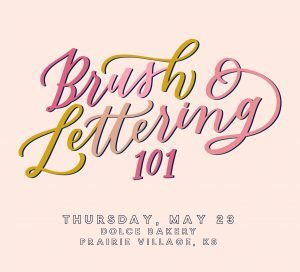 Brush lettering is typically done with a pointed-shaped brush pens (what I teach at my workshops!) where you use pressure to achieve thin upstrokes and thick downstrokes. Watercolor lettering is typically done with a water brush or paint brush and watercolors (you will also learn this at my workshops!). Hand lettering can vary a lot in look and style, but is typically letters drawn or illustrated by hand, and can be done with a variety of tools and supplies. Fauxligraphy is a form of lettering made to look like calligraphy or brush lettering, where you fill and drawn in your downstrokes by hand (instead of using pressure). That’s a quick overview with just my opinions based on my experience, of course! Do I bring my own supplies to your workshops? Nope! All supplies, worksheets and paper are provided. Along with light eats and sips. So all you need to bring is yourself! Do I need to have experience with lettering or calligraphy? Nope, nadda, none! This workshop is open to anyone 16 years old and up. (Those under 16 years can definitely attend a workshop with an adult! See more below.) You do not need to have any experience at all! I will provide all of the supplies, worksheets and instruction. Trust me, with practice, anyone can learn! Do I have to be over 16 years old? Yes, we do require attendees to be over 16 years old if they are attending by themselves. The in-person classes last 2.5 hours and we cover a good amount of content. However, If you have a child that is 10-15 years old that would like to attend, we would love to have them! We just require an adult to attend with a student, and 2 tickets to be purchased. You can also check out our online workshop here on my website as well, which is a great fit for younger people, too. Do I have to attend with a friend? One of my main goals for workshops is for you to feel comfortable, inspired and creative. I know how it is to show up at an event “alone” and feel super out of place. That is not my intention for my workshops. You can come by yourself, and your seat will be saved at the table with your name on it. That way you can excuse the awkward trouble of finding a seat. You will be able to chat with other attendees, and you’d be surprised how many people find they have lots in common! If you decide to attend with a friend or family member, I will gather that information from you ahead of time, and will seat your people all together! This is often a fun friends outing, mother/daughter time, sisters or co-workers! What types of people attend? It’s fun to see how varied our attendees are. They are different ages, they have different professions, they have different interests, but they’re all gathering at the table with a shared interest of pursuing their creativity. We often have people with demanding careers looking for a creative outlet, people who work in health care, engineering, teachers, stay-at-home mamas looking for a new hobby, graphic designers, small business owners, wedding industry-ers, and the lucky retired ones! I’m left handed – can I take a workshop? Absolutely! I have a few tips and tricks to help lefties, and have taught many lefties over the past four years. Many of my left-handed lettering students have been among the most talented and made the most progress in class. Don’t sell yourself short – you can do it! Do you offer private workshops? Yes! I offer private workshops to a minimum of 6 people for corporate groups, friend groups. We offer a per person discount for private workshops, and those can be scheduled by email, or by filling out the contact page. What if I can no longer attend a workshop I have paid for? We understand that this is life, and emergencies come up! Because of that, we don’t believe workshops should be non-refundable. If you need to cancel 7+ days before the workshop, you can either transfer your seat to a future workshop, or you can receive a 50% refund. If you cancel 6 days or less before the workshop, you can send someone else in your place to attend the workshop, or you can receive a 50% refund. I want to host workshops or events in my own city. Do you offer coaching? Yes! Since 2015, I have focused on connecting with my students, the workshop aesthetic and style, and growing an intentional brand behind my workshops. Nearly every workshop I’ve hosted since 2015 has sold out, thanks to the support and encouragement of our community, and also in part to the strategies and specific way we’ve come to do workshops. I have definitely learned and improved and changed things over time! I’d love to help you host your own workshops (lettering or not!). More S P R I N G & S U M M E R 2 0 1 9 Workshops to be announced soon. We let our email listers know first about new workshop dates. Sign up to be in the know! “This was such a great workshop for beginners. Learning a modern style of lettering has been on my to-do list for quite some time. The in-person instruction helped to give in the moment pointers on how to perfect the techniques of brush and watercolor lettering. “I attended one of Lauren Heim’s beginner workshops and thoroughly enjoyed it. Lauren is super welcoming and patient with all the beginners. “I wasn’t having the best Friday, but this class totally turned that around. Seriously, so fun and loved having you teach this class! I’ll definitely be on the lookout for your next workshops!! “Fantastic time, last night! You’re a great teacher and The Olive Tree a lovely host. Thanks for making the workshop so special and personalized. Just a note! Lauren Heim Workshop’s materials, supplies, techniques and teachings that are shared at in-person and virtual workshops, are solely for use of workshop attendees. The materials, supplies and sourcing of supplies, techniques and teachings are not to be shared with any third parties without the expressed written consent from Lauren Heim.